job sire for a young hig h school client . Directors Sally H. Aubrey Maureen 0. Augusciak Barbara Earle Ballard Linda F. Bierrie Jane I. Davison John C. Evans Geraldine U. Foster William D. Irving, M.D. Honorary Directors Lyttleton B.P. Gould, Jr. Grace Hamilton Frank Hamilton, Jr.
Helene Fenger. The immediate impact of her work was evident this year in what was a major milestone for H igh Hopes ... we were awarded a $220,000 Challenge Granr from the prestigious Kresge foundation for rhe future expansion of the H igh Hopes facility. through rhe generous support of individuals and Foundation grants. Another 200 of our program parricipants came co us as field rrip groups, and for ocher experienrial learning acriviries. Some of those groups were from Ease Lyme Middle School, Lillie B. Haynes Elementary School, and Connecticut Services for the Blind. our Summer Camp program. Tbi s year, we served 78 children and approximately JOOyouth volunteers. that's something abour High Ho pes rhat will never change. Shaping the future of Therapeutic Riding , one graduate at a time . Instructor training course graduates, Becky Cahill (L) with Poncho and Kate Beaugard (R) with April. of a major fundraising campaign co expand the facility and increase our endowment. been involved in designing the increased space, and we are confident chat t he new facility will enable us co improve the ourcomes of the High Hopes experience for the many people we serve. Thanks ro both the Dairch and Gui tat families, we were able co acquire another 62 acres of land contiguous to our existing property, giving us a tota l of l 25 acres of land. As pare of our overall expansion projecc, the additional land will give us increased flexibility as we move forward. We are fortunate co have such generous friends and neighbors co help us achieve out goals. Speaking of friends, Mark and Dorinda Winkelman hosted our biennial benefit event, Symphony in the Meadows, at their home in Essex on June !Och. With more than 750 contribucors in attendance, chis event was a record-breaking success. As we look forward co the future wirh optim ism, we also reflecc on our past and all of the wonderful people who make up ou r history and share in our achievements. They are our roots, and ma ny of them are still active supporters and volunteers . Ir is because of their strength, wisdom and insight rhat High Hopes is as strong as it is today. J look forward to building on this strength as we continue to meet the challenges chat lie ahead. Ms. Becz Haa rtz Mr. & Mrs. Frank \'I/. Hamilron,Jr. Mr. & Mrs. Jo sep h N. Greene.Jr . Mr. & Mrs. Thomas F. Moore, J r.
By directing t heir Ann ual Appea l gifts to t he care of our horses, t uit ion for our riders, and our driving program the fo llowi ng individuals have show n a special commit ment to what High Hopes is all about...our horses and rid ers! Mr. William H. Moor e Mr. & Mrs . Charles C. Osborne This year one of our riders asked his dassmates to help High Hopes Instead of bringing gifts to his birthday party. They made donations in th e amount of $900 and decided toge ther to adopt a horse/ Pictured above is that ve,y special young man, Ian Moses Cannon, proudly displaying a photo of his class'sadopted horse, Ben. Mr. & Mrs. Chapman Berry, Jr.
Mr. & Mrs. Matthew G. Ely,Jr. Ped iatric Associares of New London, L.L.C. ShepardKrech,Jr. Mr.& Mrs.BreckS. lardner Mr. & Mrs. KennethC. Levin Mr. & Mrs.JeffreyLovelace Mr.& Mrs.RichardLovelace The Rev. & Mrs.Jamesi.. Lowery,Jr. Mrs. William F. Flaherty Roberr N. Founrain M r. & Mrs. J ohn E. Fri d ay,Jr. High Hopes gratefully acknow ledges the Companies and Foundat ions that extend the ir support on behalf of their employees' commitment to our work. The Henr y Luce Foundation, fnc. The Pfizer Foundation Phili p Morris Companies Inc. Gifts in kind, of goo ds and services, enr ich Hig h Hopes in many ways, and often come ano nymously in response to very t hought ful awarene ss of our needs. A2Z Screen Printing Barbara & Marr Abrams Dr. Pe,er Aide Debora Aldo Linda Almeida Dr . Norman D. Ashcmfc Sharon Bano n Suzie Birks Ga ry F. Borla The Bowerb ird Rudy & Irma Brandt Krisrin Breiserh Helen Burkanh Lisa Bu,karrl1 Erin Cain J ohn A. Caltabiano, D VM Sabrina Catlett Sarah Cade n Norman Cavallaro ar North Cove O utfitters J im Childress, Ccnrerb rook Archi,cc,s & Planners Joanne Church Ciel, Inc.
have contr ibuted to our campaign to date, and the list below includes all dono rs to Phases I & II throug h September 15, 2000 . J. Walmn Bissell Foundarion, I nc. inner-cities of New London , New Haven and Middlesex counties . Essex Savings Bank Community lnvescmenr Program The Fish Talc Inc. Fleer The Community foundarion of Greater New Haven The Allene & Jer ome Lapides Foundarion. Inc. Douglas & Eleanor Seaman Charitable Foundation Max Solomon Foun&Hion The Community Foundation of Somheasrern Connccricur Schering-Pl ough Foundarion. Inc. SNET Corporation's Employees' Commun iry Services Fund Louis F. & Mary A. Tagliatela Foundation. Inc. The J.F.C. 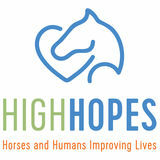 Charitable Trust TAP Holdings, Inc.
Achievement and self-confidence abound at our Annual High Hopes Horse Show. Thanks to all who made thi s hig,h light of our riding year possible. Sourheasrern New England, Inc. Coldwell Banker - Alexis Devlin Colonial Bassett Hound Rescue, Inc. Counrry Rescauram Doug ·s Garnge Fox Ledge Tack Shop Good-Spirits Shoppe, Inc.
Jake and Greta Jacobs pin a blue ribbon on April for rider Whitney Viola. Above: Linda Almeida with Cloud. Right: Cheryl Heffernan with rider Sabrina Catlett on Filly. whe re a volunteer can feel the direct impact of their efforts. In the ring you see and share the joy and pride experienced by a rider-you r rider - as they reach toward a new level of achi evement. On an event committee , you are swept up in posit ive energy created when a group of dedi cated volunteers produce an event that is both successful and truly enjoyed by all who attend. As a membe r of Hi g h H opes' Board of Direccors you can actively participat e in building the foundation and providing direction ensuring H ig h Hopes' continued success." John Sturges (L) and John Molochko (R). What we have done for ourselves alone dies with us. What we have done for others and the world remains and is immortal. Albert Pine "At Hi gh H opes it's all about attitud e th e positi ve, encouraging, loving attitud e chat just continu es to be pr esent every day." High Hopes voluntee r Mary Mille and Poncho •celebrating the dedi cation of the volunteer• on the cover of Strides, summer 2000. U.S. Coast Guard Academy cadets assisting High Hopes. chat just continu es to be present every day." 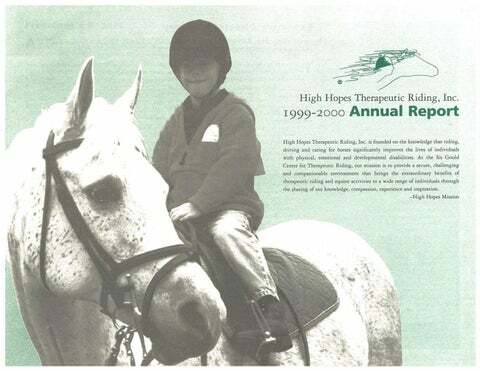 High Hopes volunteer Mary Mille and Poncho "Celebrating the dedication of the volunteer" on the cover of Strides, summer 2000. Leslie Bar low Carlton M. Barlow, Jr.
Diane Eastman Kelliann Eckerc J onnie Edwards Bech Ehlers Don Eldridge Kyle J. Eldridge Kristin A. Elliott Leas Philip Ellswonh Jr .
Joseph N. Greene, J r.
Ors. Elgarr. Pinn & Gordon Duble & o·Hearn, Inc.
Cencr.tl Conneccicut Co -op Farmers Assoc. Susan Griggs - CrossroadsTravel Dahlke Financial Group. Inc.
Waller. Smith & Palmer , P.C. The Bee & T histle Inn Bennie's Farm Marker The Black Seal Caff Roucier C Design, Kelley Cahill Cenccrbrook Architects and Planners Chalmers & Co.
A.G . Edwards & Sons, In c.
C,ulficld & R idgway, Inc.
Thomas Rubcrri - Madison Chrysle r Jeep Dodge Saybrook Country Barn Sennheiser Electronic Corp.
"On every level. .. High Hopes has taken an important place in my heart. I, as a volunteer, have been part of a very positive, hopeful process." John & Susan Senning Shoreli ne Eye Group, P.C. Sally). Bill David S. Brown, M.D. Mr. & Mrs. Frederick Worcescer, Jr.
Karen & Bernard Schwan: Deborah & S. Spencer Scott, Jr.
Mr. & Mrs.Jomes J. Korst Theodore Kulpilc Mr. & Mrs. Delano Lidd, Jr.
Mr. & Mrs. Samuel D. Parkinson Geoffrey Paul. â&#x20AC;˘1t11dirtd finanrial Jldl,,,,,nlJavailab/, ,n H1gbHop,,o/Jirr. High Hopes Therapeuti c Ridin g, Inc.